Nigel Farage says the electricity bill for his 620 square foot office is over £3,000. 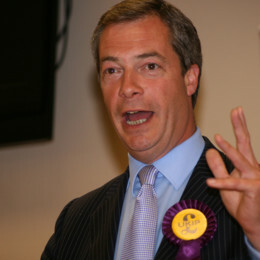 "Like millions of Britons, Nigel Farage is being ripped off by the Big Six energy companies. But it's ok for him because the EU and British taxpayer are picking up the bill. If Nigel really believes in cutting EU waste he should join the 10,000 who have already signed up to The Big Deal on energy. We will demand the best possible deal from energy companies as they bid for the right to supply thousands of homes across Britain and one shed in Bognor Regis." The Big Deal is today writing to all UKIP MEPs asking them to save taxpayers' money and cut EU waste by joining The Big Deal. The average household dual-fuel (electricity and gas) energy bill is £1,200 (according to Consumer Futures). The average size of a British home is 1,042 square feet (according to the Royal Institute of British Architects: http://www.dailymail.co.uk/news/article-2535136/Average-British-family-home-size-shrinks-two-square-metres-decade-increasing-numbers-forced-live-flats.html). ThisIsTheBigDeal.com is a national campaign for cheaper energy bills. It harnesses the collective buying power of its members to deliver huge savings. Sign up is free, takes less than 60 seconds, and there's no obligation to switch. It will save its members hundreds of pounds. 10,000 people have already signed up. People can sign up at www.thisisthebigdeal.com or over the phone on 0333 222 5871 (standard rate).